Home » Blog » Carbon County Environmental Center visit. 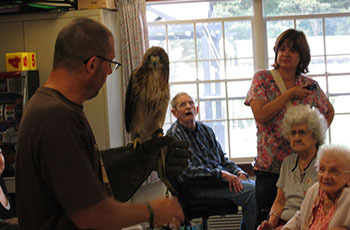 We recently had a visit from the Carbon County Environmental Center. The residents enjoyed the show. The Speaker brought animal skins, a hawk, a opossum and a snake. They enjoyed this so much we have invited him back in the spring. "The therapy people are beautiful, they helped me so much That I will be able to go home soon."